Update – May 24, 2016: North Carolina Sea Grant releases new video about Hyde County resiliency efforts, specifically focusing on elevating residential homes. 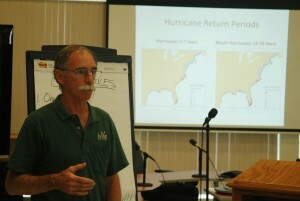 On July 1, 2014, representatives from North Carolina Sea Grant and Georgia Sea Grant met with various mainland Hyde County stakeholders to discuss coastal climate hazards unique to their communities. The meeting was just one part of an ongoing planning process that will result in a Coastal Resiliency Plan crafted specifically for mainland Hyde. Please see below for background information about the planning process, as well as future opportunities for participation. The meeting proved to be a constructive platform for local officials, residents, business owners, and County employees to exchange candid dialogue about coastal hazards such as current and future flooding, saltwater intrusion and catastrophic storms. North Carolina Sea Grant representatives opened with several short, informative presentations. Topics included flood insurance discounts, grant options for elevating structures, storm-resistant building design and local storm history. Jessica Whitehead, coastal communities hazards adaptation specialist with NC Sea Grant, facilitates a meeting between Sea Grant representatives and Hyde County stakeholders. Photo by Rhett Register. Open discussion of issues related to flooding and saltwater intrusion dominated the majority of the meeting. Local stakeholders shared valuable knowledge with Sea Grant representatives through personal accounts including past experience with state and federal agencies, programs and policies. The group stressed the economic impacts of flooding that affect agriculture, fishing and small business. Social and long-term health impacts were also discussed. The meeting concluded with examination of various strategies for mitigating the effects of coastal climate hazards on mainland Hyde. “As Hurricane Arthur reminded us, flood threats can arise quickly, so being prepared beforehand is key,” says Jessica Whitehead, coastal communities hazards adaptation specialist with North Carolina Sea Grant. “We’ll study a broad range of the ideas that Hyde County’s local experts had, from low cost options, like better newsletters for residents on what to do after a flood, all the way to more costly options, such as constructing more dikes and improving the Engelhard Sanitary District. Input from the meeting will help direct the final report prepared by the North Carolina and Georgia Sea Grant programs, which will be utilized as a planning tool by Hyde County’s Office of Planning and Economic Development. Thank you to all who participated. Spencer Rogers, coastal construction and erosion specialist with NC Sea Grant, discusses storm history at a meeting in Hyde County. Photo by Rhett Register. In partnership with the Hyde County Office of Planning and Economic Development (OPED), the North Carolina Sea Grant and Georgia Sea Grant programs are working on a Coastal Resiliency Plan for Hyde County. The project is grant funded by NOAA through the National Sea Grant College Program and is also taking place in St. Marys, Ga. The project’s purpose is twofold; to assess how Hyde County is vulnerable to coastal hazards, and identify possible action plans to help ensure our community’s economic future. Coastal flooding, storm surges, extreme rainfall events, and future sea level rise are among the major hazards to be addressed. North Carolina Sea Grant will work closely with OPED to inventory local vulnerabilities and propose various action plans. An initial meeting with local stakeholders took place in November 2013. In early March 2014, North Carolina Sea Grant conducted interviews with Hyde County officials and staff. The July 1 technical input session was the first of a series of public meetings to take place this year. Georgia Sea Grant will provide expertise on the costs and benefits of all possible scenarios. A major incentive for implementing recommended action plans is the potential for local residents to receive reduced flood insurance rates. The final report will act as a planning tool with options tailored specifically for Hyde County government. Anyone wanting to participate should call Kris Noble, 252-926-4180. 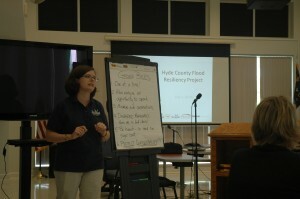 To learn more about the project, visit http://georgiaseagrant.uga.edu/article/hyde_county_nc_planning/.